I don't know about you, but in the morning I will try anything and everything to wake me up. 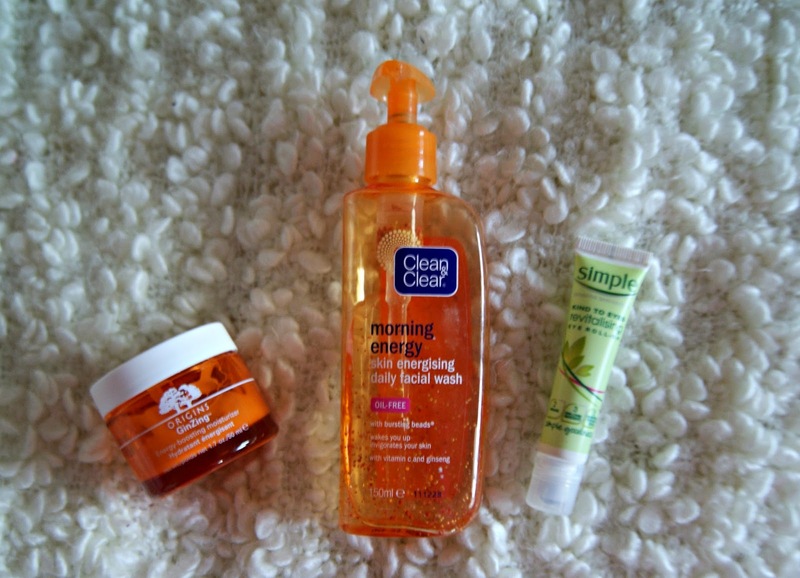 Since I've been having to get up at 6am for uni, these three products have been lifesavers and I thought it was about time I shone the spotlight on them on Cocoa May. The first being the Clean & Clear Morning Energy face wash. This has been in my skincare routine for years now, as I've found it really does help to wake me up first thing in the morning and it has a light scent of oranges which I really like. I didn't realise how amazing it was until I tried using something else in the morning and just didn't feel as awake as I did when I used this! Plus this bottle last for months - you only need one pump and as you can see I still have a third left, after having it for a good few months now! The second step is the Simple Revitalising Eye Roll on. There are a fair few of these knocking around, it's the usual metal roll on ball with a light gel that you sweep on under the eye to cool any puffiness. I generally don't suffer from puffiness but this does help to open up my eyes and is nice and cooling. Finally, the higher end product in my routine - the Origins GinZing moisturiser. I have a full review of this coming up on Friday, so I won't go into too much detail here. Basically, it smells like Terry's Chocolate Orange (a winner in my eyes!) and has been an absolute godsend for my skin! Come back on Friday for my full thoughts on that.